Lets take a look at the last 7 days of fishing, as there were some major changes. Last Friday, Saturday, and Sunday we had some great fishing, even in the big winds and rough sea conditions on the weekend. There were great catches around Roger Curtis, a few fish at Cowan, a few fish out on the Hump and we also had some hot action off the QA. 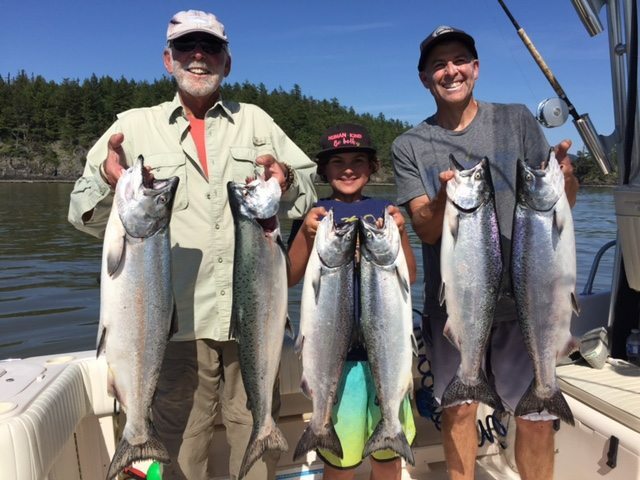 Monday was also good if you were on the fish as they were in a pretty specific spot, and Eddie was on them indeed, with a double digit hook up day and a limit of 8 chinook to the boat. Then Tuesday came and things really took a turn for the worse. The bite was definitely off and you had to work very hard for even 1 fish. Tuesday was also a new moon and there were some big tides. These big tides sometimes turn the fishing off for a few days and that certainly seemed to be the case locally as it was slow on Wednesday as well. Thursday things picked up a bit, but still on the slow side compared to the amazing fishing we have seen these past 5 weeks. Three generations had a great day on the water with Captain Eddie! So where did they go? Well we are now into mid May and this is often the beginning of the turning point where we start to see things cool off a bit locally and things heat up a bit over on the other side of the Strait. 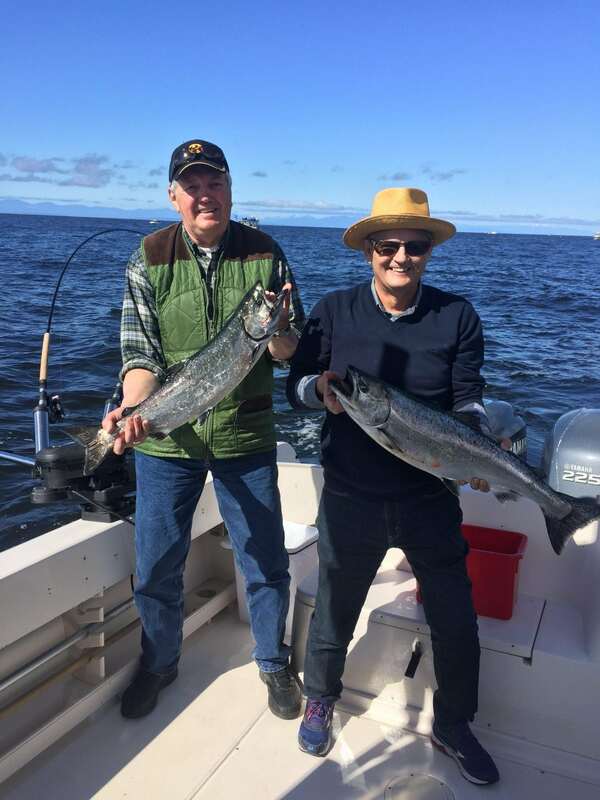 Not that the fishing hasn’t been very good at Galiano, Gabriola, and Nanaimo all of April and early May, because it has been, but as we move into late May and especially early June, the fishing is often a bit better on that side. Tom’s guests showing their catch some love. I fully expect it to pick up locally in the next few days as well. Once these big tides back off, the bite will come back on and if history repeats itself we will have some good fishing in late May and early June off S. Bowen and the Hump. Just keep in mind we had it pretty good for 6 weeks where you could just troll from Roger Curtis to Cowan and get your limit, or even just fish the QA. Now I think we are going to have to work slightly harder for the fish by finding the bait and finding little pockets of fish and staying on top of them to maximize your day. 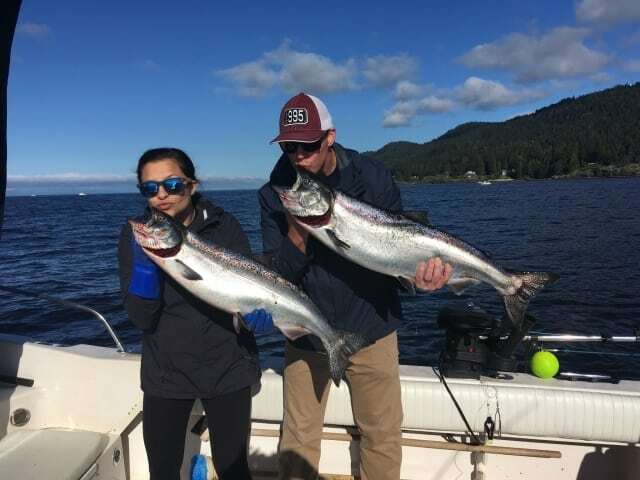 Captain Khoi’s guests with their catch off of South Bowen. Prawning is open, but the commercial boats are out in full force and it is a big risk is you set traps while they are fishing. A friend lost all 4 traps the other day, so currently we are not prawning in our local waters. If you are in an area where there is no commercial pressure, it should be productive. The crabbing has been pretty good this past week and this should continue through the rest of May and into June. Make sure you follow us on Instagram and Facebook as I will be posting some pictures later on this afternoon of productive flashers, spoons, and hootchies that we have been using.